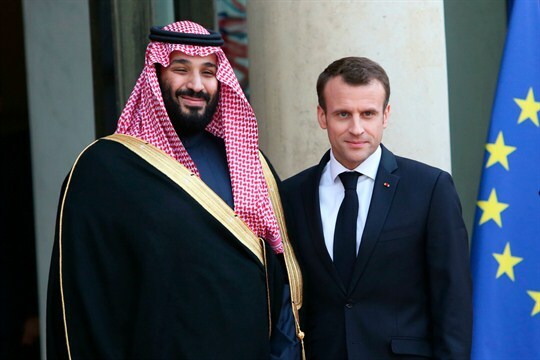 French President Emmanuel Macron receives Saudi Crown Prince Mohammed bin Salman at the Elysee Palace, Paris, France, April 10, 2018 (Sipa USA photo via AP Images). For the first time since it was founded in 2006, the United Nations Human Rights Council earlier this month rebuked Saudi Arabia for its human rights record. In a rare show of unity, the council’s statement, which condemned the kingdom’s “continuing arrests and arbitrary detentions of human rights defenders,” was co-signed by all 28 members of the European Union. But that move coincided with another unanimous decision by EU member states: to prevent Saudi Arabia from being added to an EU blacklist of countries with insufficient controls on money laundering and terrorism financing. In an interview with WPR, Julien Barnes-Dacey, director of the Middle East and North Africa program at the European Council on Foreign Relations, explains why the EU cannot maintain a unified stance on Saudi human rights abuses.